As we indicated in the previous post, there were intimations at the recent council budget retreat of major changes in the very structure of how the city delivers services and touches lives. One of the most startling proposals was the notion of “repurposing” some millages that were previously approved by the voters for very specific services, including the Ann Arbor Transportation Authority millage, which has traditionally paid mostly for bus service within Ann Arbor. Suddenly a lot of different people have plans for that millage, and they are not compatible. If city officials succeed in achieving the goal of “repurposing” the millage, the future of our city bus system is in question. Since then, the millage has been eroded by the requirements of the Headlee Amendment to a little over 2 mills. But because it is in the city charter, it never has to be renewed and can only be removed by a vote of the people. In contrast, most modern millage issues have a fixed time limit. Local transportation issues (under Public Acts 55 or 196) usually have to be renewed every five years. So the AATA millage is a little gem that few in government would surrender easily. But though AATA was originally voted in and incorporated as a body to provide bus service to Ann Arbor, it has been expanding its reach for some time, running buses out to other communities under Purchase of Service Agreements (POSAs). The costs of these are partly paid for by Federal and state funds, but there is a charge to the various municipalities thus served, who are not paying the tax that Ann Arbor citizens do. As I described in a previous article written a year ago, there have been numerous discussions about AATA becoming a county-wide authority. The AATA board, which is appointed by the mayor, took a straw vote at a May 2008 workshop to work toward becoming a regional authority. In late 2008, the board heard from an attorney, Jeff Ammon, who has specialized in the conversion of local to regional transportation authorities. Things went slowly until the new CEO Michael Ford was installed. On November 18, 2009, the board voted to move toward becoming a countywide system. On December 8, they really rolled out the carpet and the canopy and invited the community to a meeting at Washtenaw Community College with croissant sandwiches and experts. Their attorney, Jerry Lax, and Jeff Ammon prepared some very helpful and clear materials to explain the ins and outs of becoming an “Act 196” authority. This is the Public Act 196 under which regional transportation authorities are organized (AATA is organized under Public Act 55). As the illustration shows, there are three basic models: the “service contract” (which is essentially what AATA has been doing), the “donut”, in which the city authority would remain separate from the county millage and maintain its current local service using the city millage, and the “layer cake”, in which the city retains its existing millage but also joins the county entity, with various service contracts between the city and the rest of the county, but with the county millage providing a stable funding for all other transit needs for the region. Note that all three models require the use of the Ann Arbor perpetual millage to maintain Ann Arbor bus service. But city officials have some other ideas about the use of that millage. Indeed, it is clear that they have been casting an envious eye at that little pot of cash for some time. In 2008, with little fanfare, the designation on the property tax bill changed from “AATA” to “Mass transit”. Meanwhile, the millage is now shown as part of the General Fund, though, as city administrator Roger Fraser said at the budget retreat, “it is an amount over which you (council) have no control or discretion”. One of his “suggestions” (he declined to call it a recommendation yet) was to “reduce or repurpose the general fund support for AATA”. He noted that the council would have to use those funds for a public transportation system, and that it could not be used for streets. Tom Crawford, the city’s chief financial officer, said that the city was not legally required to send the funds to the AATA. So what would the city use the funds for if not for the services offered by the AATA? Multimodal transportation was named. 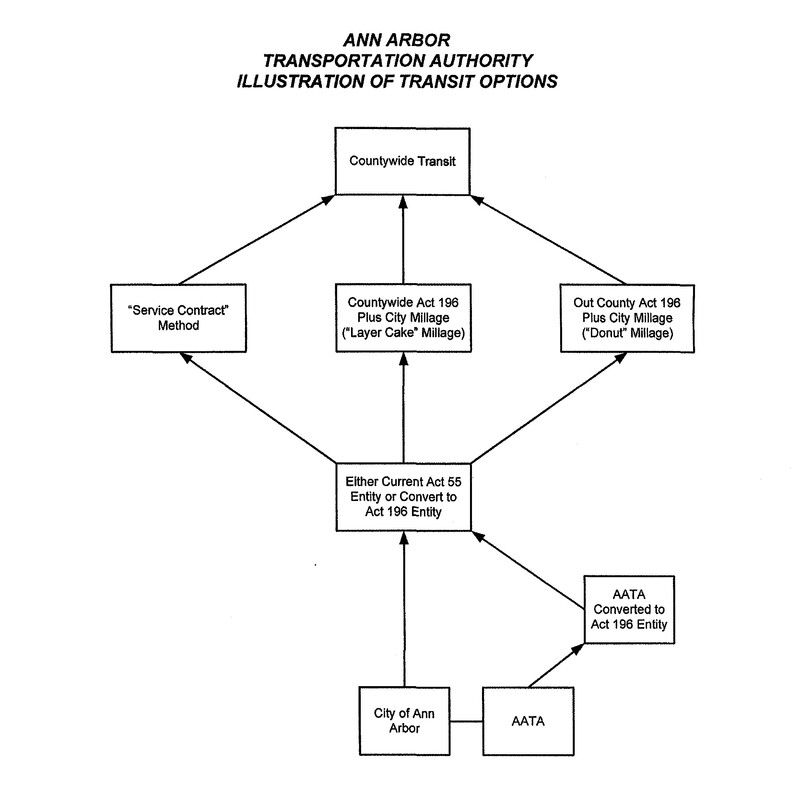 In later discussion, it was pointed out that after an AATA conversion to an Act 196 authority, the funds from the Ann Arbor millage could be used for the local connector study, the east-west rail, or WALLY. This would be the next step to fulfill Mayor John Hieftje’s vision, as first expressed in the 2006 “Mayor’s Model for Mobility”. He advocated a muscular approach to many forms of transportation other than the automobile, i.e., multimodal transportation. With the firm hand of transportation coordinator Eli Cooper guiding it, the policy was fleshed out in the Ann Arbor Transportation Plan Update, passed by council on May 5, 2009. (A copy of the large file for the plan is found here. ) 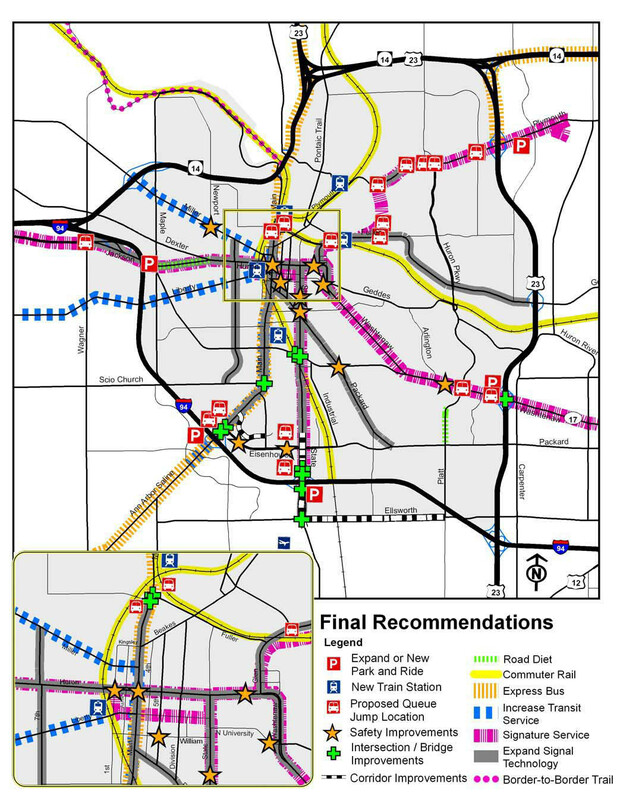 The resolution for the “connector study”, for which the council appropriated $80,000 from the General Fund on June 15, 2009, states that “The Ann Arbor Connector is intended to provide a rapid-transit linkage between the proposed east-west, Ann Arbor to Detroit, and north-south, Ann Arbor to Howell, regional commuter rail systems, the Ann Arbor Transportation Authority (AATA) and University of Michigan (UM) local transit service.” The Ann Arbor Chronicle has provided a good chronology of its history, that also explains the AATA’s payment of $320,000 to support this study. Clearly the study is meant as the first implementation of the AATPU’s signature route plan. The first step in realizing this vision has already been taken. As explained by the Ann Arbor Chronicle, the council has already approved contracts for preliminary design of the Fuller Road Station (previously the Fuller Intermodal Transit Station, or FITS). Those contracts with the design firm JJR are for approximately $650,000. But according to AnnArbor.com, the total cost of the project is estimated at $40-45 million, with the city to pay 22% of that. Clearly this expansive vision is going to be hungry for dollars. Cooper has been vague when questioned about funding sources. Cost of the total plan is estimated in the AATPU as $185 million without the signature routes included. That would be divided among the city, AATA, and the state department of transportation (MDOT). The $45-50 million for FITS is also not included. So when city officials say “multimodal”, the dollar signs start to spin. Access to the AATA millage would be a g0od start. Sue McCormick, who occupies a place on the AATA board despite also being a city employee (a case of incompatibility of office that really should be challenged on legal grounds), was very alert at the December 8 AATA Planning and Development committee meeting. When the group was discussing use of an MDOT equipment grant (probably the last for a while, since MDOT is out of money) for new buses, she asked whether the grant was limited to that – or could it be used for multimodal? McCormick could be excused for that, since as the Public Services department head she has already seen over $160,000 taken from the infrastructure funds (roads and sewers) that she is responsible for to feed FITS. The timetable calls for AATA to have new articles of incorporation as an Act 196 approved by mid-January of next year, and for council to adopt a resolution dissolving the old AATA “because it has no more assets and no longer does business”. Could that be the signal for transfer of the city’s millage to multimodal projects? (Crawford is probably correct that this would be legal, since it would still be for a “public transportation system”.) And how will our bus service be funded then? What has not been discussed much lately is when a millage vote across the county will be held. A preliminary survey indicated a lukewarm response to the idea across the county. Ironically, since AATA has been subsidizing the Ypsilanti area, the eastern part of the county had a more negative reaction than did the Ann Arbor area. The potential consequences are enormous. AATA has traditionally been “the bus service”. It is also a very important means of transportation to the disabled and elderly, via what are called in the trade “demand services”. In Ann Arbor that is A-Ride, a “shared-ride, door-to-door transportation service for individuals who are prevented from using AATA fixed-route bus service due to a disability.” AATA buses are also low-floor vehicles with accommodations for people in wheelchairs or who use walkers, etc. As the only public transportation in town, AATA is also essential for mobility of low-income people, people without drivers’ licenses, or anyone else for whom driving is not an option, even for a moment. In the recent years all of us who live or work in Ann Arbor have been encouraged to “take the bus” instead of driving, especially to downtown (we have an agency devoted to this, getDowntown). By doing so we hope to save energy, reduce congestion, and avoid taking up parking places. But with the recent emphasis on commuters coming in to Ann Arbor, the intracity routes have been under pressure. If we are dependent only on a county millage, this trend will accelerate. And if the millage vote fails, will there still be a city bus system at all? UPDATE: The Ann Arbor Chronicle has now published a thorough account of the special meeting on December 8. SECOND UPDATE: AnnArbor.com has now published the AATA staff response to the report by Ted Annis. They don’t agree with his calculations, or presumably, his purpose. NOTE: Continuing reporting and opinion on this story and all transportation issues may now be found by referring to the Transportation Page. This entry was posted on December 10, 2009 at 4:22 pm and is filed under civic finance, Sustainability, Transportation. You can subscribe via RSS 2.0 feed to this post's comments. You can comment below, or link to this permanent URL from your own site. So now we finally see what is meant by “reduce or repurpose the General Fund support for AATA”. I was confused about what this might mean, but your post makes this brutally clear. The permanent millage voted by Ann Arbor citizens for a local bus system has been renamed General Fund, and there is a strong possibility that it could be raided to help fund the proposed multimodal Fuller Road facility to accommodate regional commuter rail lines. I wondered where the city was going to get the money for that. When my husband and I bought our condominium 18 years ago, a very important consideration was its location on AATA fixed-route bus lines. Since then the evening and weekend service has mostly been discontinued, so as a non-driver my options have been reduced. Ordinary bus service is apparently too boring for real “movers and shakers”, compared to glittering dreams of regional rail. Fortunately for bus riders, I do not believe there is the slightest possibility that a county-wide transportation millage will be approved by voters in the near future. The combination of bad economic times, strong anti-tax sentiment in large parts of the county, and general resentment of Ann Arbor City’s big plans make this an almost impossible sell. If current AATA users see proposed raids on their system’s current funding, that will convert possible supporters into opponents. Hopefully, the City Council will back off this amazingly silly proposal. Thanks for posting this. While the economy is soft and gas prices are low, we have an opportunity to address mass transit. It won’t be long after the economy recovers before gas prices rise beyond $4 per gallon again. It would be nice to have transit improvements in place before that happens. Unfortunately, the state funds road construction and mass transit by taxing gasoline sales. Decreasing population, decreasing economic activity and increasing fuel efficiency cut into our transportation funding. The less gas purchased, the less transit taxes are collected. All transit also receives federal subsidies that require local matching funds. Our declining state funding of transit endangers our ability to meet the federal local matching funding levels. So, while this is an opportune time to improve mass transit, we simply lack the public funds to do so. While some transportation leaders hope for a revised state funding mechanism, it seems unlikely that Lansing will increase taxes to fund transportation during the coming election year. In light of these fundamental funding problems, it is disheartening to learn that local officials might divert transit funding from AATA to the various other very expensive projects – FITS and Wally, for example. Again, thank you for the great coverage of this important issue. In my outrage over what the administration proposes, I neglected to thank Vivienne for attending this meeting and posting to inform the rest of us in the community. Vivienne, be assured that we are grateful. If this meeting was not covered by anyone from the Ann Arbor Chronicle, or Ann Arbor.com, or any of the other political blogs, you have a scoop, Vivienne, and I hope this is appreciated by others as much as I appreciate it (especially when the west side lost power in our first winter storm). Actually, the meeting was very well reported. Both AnnArbor.com and the Ann Arbor Chronicle, as well as WEMU, had reporters there and have published stories. They did straight reporting, though. I get to add the interpretation.